Regardless of the season, anytime is the perfect time to go for a dip on Bellevue property. At Bellevue Aquatics Center two pools keep the local community cool with a year round calendar. Offering swim lessons, rehabilitative therapy, open swim, and birthday parties the indoor facility is a prime liquid asset for the city. The warm spring therapy pool maintains a soothing temperature perfect for water therapy patients. Gradual entry, wheelchair entry and two ramps help ease participants into the water. Swim lessons and open swim also take place in the warm spring therapy pool during select hours. Keeping fit is a breeze in the Bellevue property Blue Lagoon Pool. Constantly in motion, six 25 yard lap lanes divide swimmers serious about practicing their strokes. From backstroke to butterfly individual athletes are in their element. Club swimmers and those serious about their sport find this the ultimate space for practice. Blocked times are just for lap swimmers wanting to maintain a rapid pace for stamina or work on stroke technique. Deep water exercise classes are also held here and feature aerobic movements. Recreational swimmers also have their own time to splash around. Many flip out on the diving board or slip on down the slide. 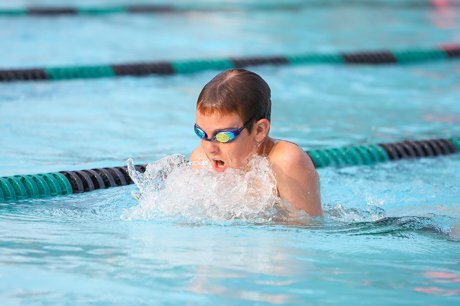 Children living in Bellevue learn swimming basics with expertise instruction. Infants and toddlers are eased into the water. Parent and me classes focus on familiarity and fun. Preschoolers rule the pool with enthusiastic teachers encouraging progress. Youth lessons turn doggy paddling into simple strokes and belly flops to elementary dives. There’s always time to conquer a new skill. Adults never having learned to swim will find patient instructors ready to teach them the moves. Private and semi-private lessons are also available. More information regarding classes can be reviewed in the current Connections Recreational Guide. Birthdays are a blast at the Bellevue Aquatic Center. Pool party rentals take place on the weekends. Lifeguards keep a close eye on little ones giving peace of mind to parents. Parties here are sure to be a whale of a good time. Friendly staff members can be contacted at 425.452.4444 to help plan the big event.